Buildings frequently suffer from the low durability of external coating layers that use mortar. Low durability can be caused by a low efficiency of the adhesion between the coating mortar and the substrate, which may be ceramic, concrete, natural stone or other material. The application of the roughcast is often used empirically to increase adhesion, however, there are few studies to support this practice. 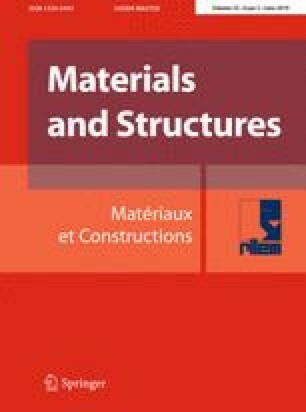 The objective of this study was to analyze the adhesion mechanisms between the substrate and the mortar layer, evaluating tensile bond strength implications beyond the microstructure in the transition zone. Two conventional mortar coatings were used, applied on two ceramic substrates fired at 700 °C and 950 °C, besides the application or not of the intermediate adhesion system (roughcast). Both mortars and ceramic blocks were characterized according to the main testing standards. The tensile bond strength was performed for all the combinations proposed. The heat of hydration of samples of the roughcast was also analyzed. The results indicated that the adoption of the intermediary adhesion mechanisms between the ceramic substrate and the mortar, referred to as “Roughcast”, significantly increased the tensile bond strength and altered the type of rupture in the test. The composition of the mortar as well as the firing temperature of the ceramic substrate also influenced the strength conditions. Funding was provided by Conselho Nacional de Desenvolvimento Científico e Tecnológico (Grant No. 2200). The authors declare that they have no conflict of interest in this study.